Once students start practicing within their learning paths, ScootPad will detect when the student is struggling and automatically scaffold content in real-time (across DOK and grade levels) providing the student with practice in pre-requisite concepts. These concepts from the learning path will appear orange on the adaptive practice dashboard. Scaffolding helps you predict if there could be ongoing issues requiring re-teaching. Quick FAQ: What does a student see in a practice session? In the short example video below, the student launches an adaptive practice and is immediately met with a time-out lesson. This is a lesson given to the student to help them learn the skill where their proficiency is very low. The student should review the lesson and then apply what was learned to improve their proficiency in the concept. Once the student’s proficiency improves and the pre-requisite concept is marked “practice done”, ScootPad will automatically present the student with questions from the next concept in the learning path. 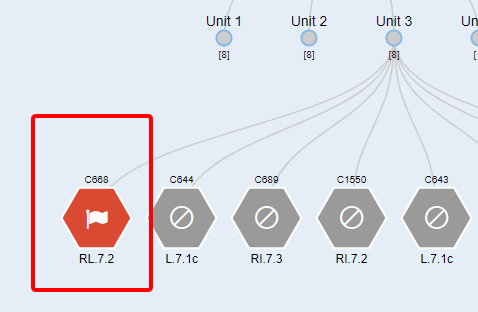 If ScootPad exhausts all available concepts for practice from the learning path, and determines a student and/or concept needs re-teaching or a different level of intervention from the teacher – this is when you’ll see concepts in the learning path in red and marked as needing “Intervention”. Keep reading to see how to provide the necessary support! ScootPad analyzes your students’ data and builds an RTI-aligned 3-Tiered Intervention Model which provides a brief snapshot of students requiring re-teaching in both Math and ELA concepts. Launching the Intervention Monitor will provide a 2-dimensional grid view (aligned to the RTI framework) to help you quickly identify and implement your re-teaching and intervention strategies. Quick FAQ: Can ScootPad help me group students? Yes! Launch the Intervention Monitor and you now have access to students ScootPad has grouped together for whole class, small group, and one-on-one opportunities. To adjust the Intervention threshold and ensure that more students can be addressed systematically and efficiently, click here for further instructions. Once you’ve identified concepts requiring re-teaching for one or more students, ScootPad offers tools to help in your strategy. Launch a lesson that students can review before attempting more questions. You can also use the sample practice questions! Quick FAQ: Can ScootPad help me re-teach? Yes! ScootPad Lessons and the sample questions in the improvement practice can help you re-teach the concept. After students have completed the Improvement Practice, measuring progress is a breeze. Below is a snapshot of a specific practice being monitored. The teacher can choose to reassign the concept to the student if additional attempts are needed. To access more in-depth reports simply click on Reports from the navigation panel and choose which report to run. Quick FAQ: How long does it take for the student to be removed from the Intervention Monitor? Once the student’s proficiency improves, they will no longer appear on the Intervention Monitor. 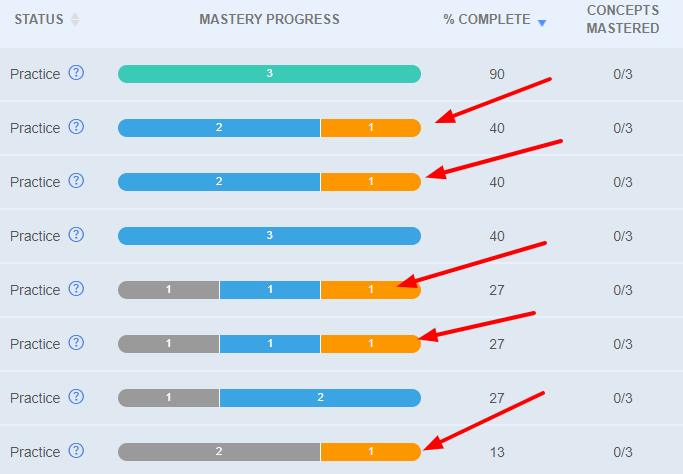 ScootPad incorporates a method to determine mastery based on the “decaying average” or a.k.a. “moving average” formula. Traditional averaging would punish the student for not understanding it at the beginning. Decaying average weights the most recent score at 65% and therefore gives a final score that better shows the student’s current understanding. You can see the difference in the outcomes below. To see Response to Intervention in action, check out this video.